I don't know why, but this just seemed like a cool scene. 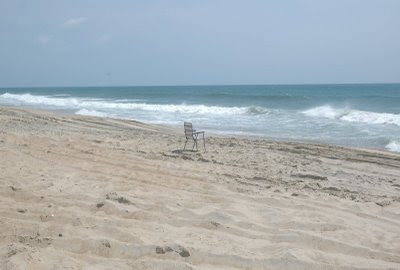 Stumbled upon this chair by itself on the beach between Avon and Buxton. It's probably still there if anyone nearby needs to sit down for a bit. That sand makes me want to be at the beach. Nice shot. I've heard about your amazing camera. It makes me feel kind of sad for some reason, like someone left abruptly to deal with something bad. I don't know why. But I love the photo.